﻿ How to Drive Tremendous Website Traffic with Email Marketing » Red Mango Marketing! Since starting their real estate firm in 2009, Robert Kinlin and Paul Grover knew email marketing would play an important role in growing their business. Successful email marketing starts with quality contacts. Autumn practices permission-based email marketing, meaning she never adds a contact to an email list unless they’ve opted-in to receive her communications. “Our emails are totally subscription-based,” Autumn says. “People will sign up for our Just Listed and Open House emails, so we know our list only includes people that are interested in what we’re selling. Then we have to include content that people care enough about to click-through and read.” With this approach, email marketing not only drives website traffic — it increases repeat visits from quality leads. Tip: Need help growing your email list? Check out our Ultimate Guide to Growing a Massive Email List. To share content people want to read, Robert Paul Properties pays close attention to their audience’s interests. 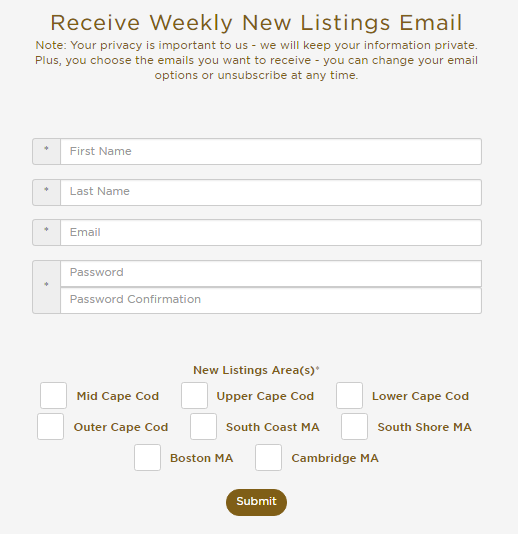 Their website sign-up form allows subscribers to check off the listing areas they are interested in, so they only receive relevant information. “Our subscribers tell us the area they are interested in seeing new listings for,” says Autumn. “For the open houses, we also have six different areas so we know people will enjoy getting those emails.” Based on their location preference, Autumn organizes contacts into separate email lists. 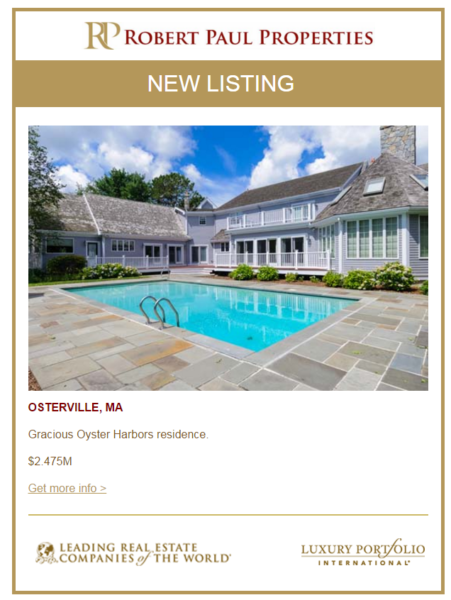 Each week, when she sends a Just Listed or Open House email, she includes only those who have expressed interest in that specific area. 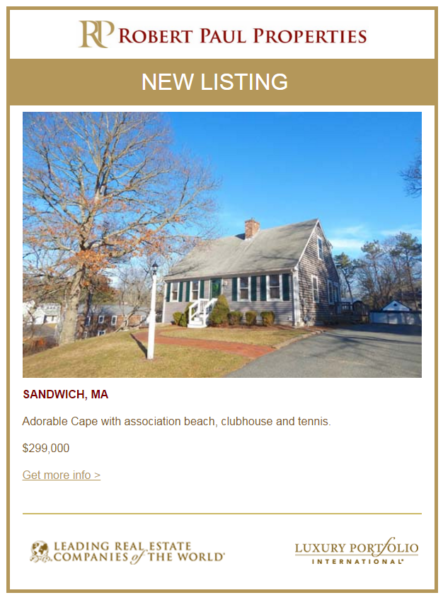 For example, the email below was sent to the people looking for information on properties on the Upper Cape. Tip: New to website analytics? Check out our Beginner’s Guide to Google Analytics. Look for ways to use social media to increase the reach of your emails. In addition to sharing resources for home buying and selling, Robert Paul Properties uses their social media channels as avenues to promote their latest emails. With Constant Contact’s Social Share feature, you can easily schedule social posts for Facebook, Twitter, and LinkedIn right from your account. Additionally, our tool for Facebook Advertising can help you get your email in front of a whole new audience. Tip: Stick to a regular email marketing schedule by creating an email marketing plan for your business. We have tools to help you do it, 15 minutes at a time. There you have it — your step-by-step look at how email marketing can drive traffic back to your own website. By encouraging your audience to visit your website, you’re helping your business appear higher in search engine rankings. Increasing website traffic also increases the time your audience spends engaging with your business online. Use your Google Analytics to see which pages are garnering the most attention and then make sure those pages are kept up-to-date. Soon you’ll be the lucky owner of an online property that helps you build relationships and do more business. Looking for a few more ideas? Try these 7 Things You Can Do to Significantly Improve Your Email Click-Through Rates. This entry was posted on Tuesday, April 5th, 2016 at 9:17 am	and is filed under Choosing Templates, content, Customer Success Stories, Email Marketing, News & Updates. You can follow any responses to this entry through the RSS 2.0 feed. Both comments and pings are currently closed.